[ABRAHAM LINCOLN]. Newspaper. 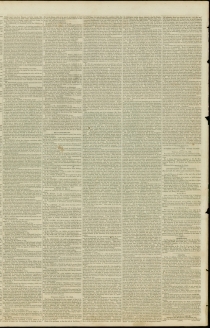 National Intelligencer, Thursday, December 23, 1847. Washington: Gales & Seaton . 4 pp. 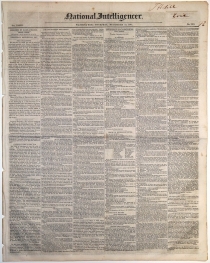 Offered with another issue of the National Intelligencer, January 20, 1848. 4 pp. 1st. Whether the spot on which the blood of our citizens was shed, as in his messages declared, was or was not within the territory of Spain, at least after the treaty of 1819 until the Mexican Revolution. 5th. Whether the people of that settlement, or a majority of them, have ever submitted themselves to the government or laws of Texas or of the United States, by consent or by compulsion, either by accepting office, or voting at elections, or paying tax, or serving on juries, or having process served upon them, or in any other way. 6th . Whether the people of that settlement did or did not flee from the approach of the United States army, leaving unprotected their homes and their growing crops, before the blood was shed, as in the messages stated; and whether the first blood, so shed, was or was not shed within the enclosure of one of the people who had thus fled from it. 7th. Whether our citizens, whose blood was shed, as in his messages declared, were or were not, at that time armed officers and soldiers, sent into that settlement by the military order of the President, through the Secretary of War. 8th. Whether the military force of the United States was or was not so sent into that settlement after Gen. Taylor had more than once intimated to the War Department that, in his opinion, no such movement was necessary to the defense or protection of Texas. Several resolutions of inquiry were here offered my Messrs. GEORGE S. HOUSTON, W.P. HALL, PHELPS GREEN, McCLELLAND, and KAUFMAN, which are omitted for want of room. 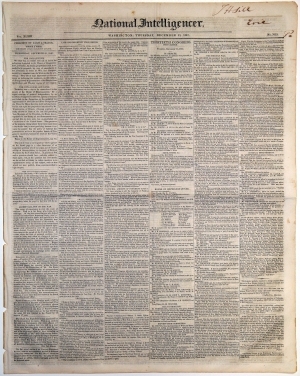 Additional news: page , middle of 4th column, prints a lively senatorial debate involving Jefferson Davis. Page , bottom of 2nd column, “Mr. 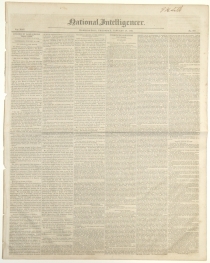 LINCOLN, from the same committee, reported a bill for the relief of William Fuller and Orlando Saltmarsh. 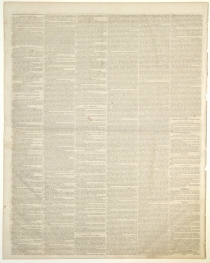 Read and committed.” Page , middle of 3rd column, “By Mr. LINCOLN: A bill to amend an act entitled ‘An Act to raise for a limited time an additional military force, and for other purposes,’ approved February 11, 1847.” This act gave the president permission to raise one regiment of dragoons, and nine regiments of infantry, to be used in the war with Mexico. In addition, the act dealt with the logistics of each regiment, such as raising the pay for field surgeons, or adding a quartermaster to each regiment.